Musical Theatre News: Full cast announced for Andrew Lloyd Webber and Alan Ayckbourn's By Jeeves! 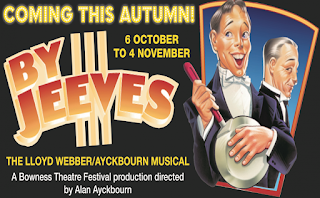 Full cast announced for Andrew Lloyd Webber and Alan Ayckbourn's By Jeeves! Updated 9th October: the full cast has just been announced for this production: The Old Laundry Theatre are delighted to announce the full cast, led by Bill Champion and Nadim Naaman, of the revival of Andrew Lloyd Webber and Alan Ayckbourn’s light-hearted, fun musical BY JEEVES. Andrew Lloyd Webber says: "I confess that this is the musical that I privately look forward most to seeing." Melle Stewart – as hedgehog lover Honoria Glossop (Goodnight Mr Tom – West End, Assassins - Menier Chocolate Factory). By Jeeves is based on the novels of PG Wodehouse which are about the valet of a rich young Londoner called Bertie. Webber and Ayckbourn's musical premiered in 1975, and was revived in the West End in 1996. Ayckbourn will direct the Bowness-on-Windermere production.It will have new sets designed by the Old Laundry Theatre's owner Roger Glossop and choreography by Sheila Carter, both of whom worked with Ayckbourn on the 1996 production. Buy tickets for By Jeeves!